Thallus: usually effigurate, areolate to rimose-areolate centrally, determinate, orbicular and 1-5 cm wide or often irregularly shaped areoles: mostly angular, plane to convex, 0.4-1 mm in diam., 0.4-1 mm thick (usually appearing very thin), confluent and losing orbicular shape; marginal lobes: elongate, contiguous, apices expanded and blunt upper surface: yellow, glossy similar to Pleopsidium, plane to convex, rough, uneven, with fissures eventually becomingdivision lines on areoles, epruinose cortex: paraplectenchymatous, pale yellow throughout with obscure cells, 30-50 µm thick algal layer: even, dense medulla: white, intricately prosoplectenchymatous attachment: broad, without forming a stipe Apothecia: numerous in central areoles; occasional in outer areoles disc: yellow, sometimes with a black-tinge, immersed, punctiform, rarely up to 0.6 mm wide, usually much smaller epihymenium: dark or light yellow, conglutinated, 15-25 µm thick hymenium: hyaline to pale yellow above, 100-170 µm tall; paraphyses: 1.5-2 µm wide at base, apices barely expanded subhymenium: hyaline, 20-50 µm thick; hypothecium: 10-15 µm thick asci: clavate, 60-100 x 20-25 µm, 100+-spored ascospores: hyaline, simple, ellipsoid to narrowly ellipsoid, 4-6 x 1.7-2.2 µm, but sometimes varying in size Pycnidia: not observed Spot tests: UV+ orange, C+ red, KC+ red in cortex, medulla, and apothecia Secondary metabolites: rhizocarpic acid (minor), epanorin, gyrophoric acid (major), lecanoric acid (minor) (HPLC: J. A. Elix, pers comm.) World distribution: Mexico, southwestern United States Sonoran distribution: Arizona, Baja California Sur, Chihuahua, Sinaloa, and Sonora. Notes: Acarospora erythrophora is usually effigurate and has been mistaken for a Pleopsidium. The C+ red/KC+ red reactions are distinctive. 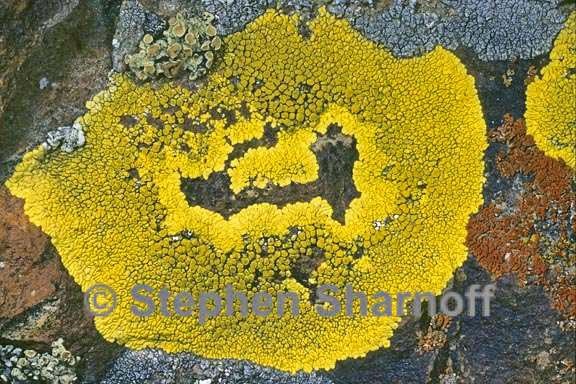 Acarospora robiniae also occurs in Baja California but has only a C+ red cortex, a thallus generally composed of dispersed areoles with yellow discs, and a strictly maritime distribution. The type locality of A. erythrophora is in New Mexico, and it occurs inland in Arizona and Sonora. parathecium: up to 60 µm thick, often forming parathecial crown Ecology and substrate: on sandstone and granite lateral cortices: paraplectenchymatous, 20-45 µm thick; cells: irregular, 3-4 µm wide; eucortex with a diffuse yellow layer above 10-25 µm thick, hyaline layer below 10-23 µm thick lower surface: lacking or ecorticate exciple: usually distinct, thick beneath subhymenium, broadening sometimes to 50-80 µm above disc, forming a inner ring around the disc Thallus: areolate, small, determinate, orbicular or not, less than 2 cm. across areoles: becoming squamulose, 2-4 mm. across, sometimes lobulate; margin: indistinct to distinctly effigurate; lobes: poorly developed, 0.5-1(-2) mm long, up to 1 mm thick upper surface: yellow-orange, smooth, becoming convex, epruinose cortex: 30-60 µm thick, with an outer, 20-40 µm thick yellowish brown layer and an inner, colorless layer algal layer: 50-200 µm thick; algae up to 10 µm diam. medulla: white, prosoplectenchymatous, intricate Apothecia: 1-3 mm wide, numerous on thallus disc: pale yellow, only slightly brown, scarcely darker than thallus with thalline margin, plane becoming convex to almost globose, sometimes corrugated, biatorine, margin completely excluded true exciple: colorless, 50-80 µm thick epihymenium: brownish yellow, 15-20 µm thick hymenium: hyaline, usually 50-70 µm tall; paraphyses: simple or poorly branched, 2 µm or less broad at base, not or scarcely thickened at apex asci: clavate, 70-80 x 15-20 µm, 100-200-spored ascospores: hyaline, simple, ellipsoid, 3.5-4.5 x 1.5-2 µm Pycnidia: immersed conidia: ellipsoid, 3-3.8 x 1.5-1.8 µm Spot tests: thallus UV+ orange, K-, C-, KC-, P- Secondary metabolites: containing rhizocarpic, acaranoic, acarenoic acids (race 1), or in N. America also rhizocarpic and roccellic acids (race 2). Substrate and ecology: on rock, especially under overhangs on cliffs World distribution: Antarctica, Europe, North and South America Sonoran distribution: southern California (Santa Cruz Island) . Notes: Pleopsidium chlorophanum differs from P. flavum in having a smooth, smaller squamulose thallus and larger apothecia. 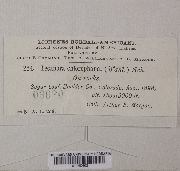 For a long time, all effigurate specimens from North America have been called Acarospora chlorophana going back to Tuckerman in the 1800's. Pleopsidium chlorophanum is a rare, alpine species in Europe. In contrast, Pleopsidium flavum is a Mediterranean species, which was recognized after P. chlorophanum, and it has a broader ecological amplitude. It is assumed P. chlorophanum occurs in North America at high elevations, but so far we have seen only one specimen from North American, a collection by Charis Bratt (#3436, SBBG!) from a rock in grassy filed on Santa Cruz Island in southern California.